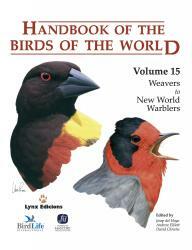 Vol 15 of this series starts with the weaver family Ploceidae and contains 116 weaver species. The taxonomy differs in some respects to "The Birds of Africa Vol 7" (Fry CH, Keith S. 2004. Helm, London), for instance Quelea and Euplectes are placed at the start of the Ploceinae (after the Thick-billed Weaver) rather than at the end. The format is as in previous volumes with an introduction to each family, and well illustrated with photographs. The family account covers Systematics, Morphological Aspects, Habitat, General Habits, Voice, Food and Feeding, Breeding, Movements, Relationship with Man, and Status and Conservation, and a general bibliography. For the weavers 69 species (59%) are illustrated by photographs. Some photographs I particularly enjoyed for their quality and/or interest were of Red-billed Queleas Quelea quelea perched on thorny twigs packed very closely together, an African Golden Weaver Ploceus subaureus nest building sequence, and Southern Masked Weavers P. velatus attacking a Boomslang Dispholidus typus. The species accounts include plates illustrating both sexes and distinctive subspecies, and text and a map for each species. EXTRA VARIANTS OR FEMALES - Bocage's Weaver, Cape Weaver, Black-headed Weaver, Southern Masked Weaver, Vitelline Masked Weaver, Tanganyika Masked Weaver, Lufira Masked Weaver, Katanga Masked Weaver, Sao Tome Weaver, PrÃ­ncipe Golden Weaver, Usambara Weaver, Loanga Weaver, Crested Malimbe, Red-headed Malimbe. BoA has extra figures of juveniles (Sociable Weaver, Dark-backed Weaver), transitional plumages (Southern Red Bishop, Yellow-crowned Bishop), flight (several Euplectes species), non-breeding males (Yellow Bishop, Yellow-mantled Widowbird, White-winged Widowbird, Long-tailed Widowbird, Bob-tailed Weaver) and an extra race of Spectacled Weaver. Eye colours are incorrect in two species: Fox's Weaver in BoA is white but should be red-brown, and Maxwell's Black Weaver in HBW is pale but should be brown. The plates in HBW at first seem pleasing but when compared to BoA, the latter plates look better.